The affordable, yet stylish ROXTER™ Hitch Mounted Mud Flaps for pickups and SUVs protect your investments against nature's unexpected surprises. 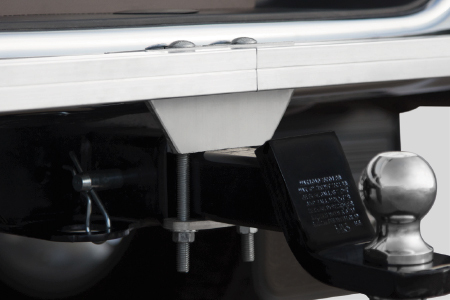 These mud flaps easily install to the ball mount with an adjustable clamping system and are easy to remove by simply pulling the receiver pin. 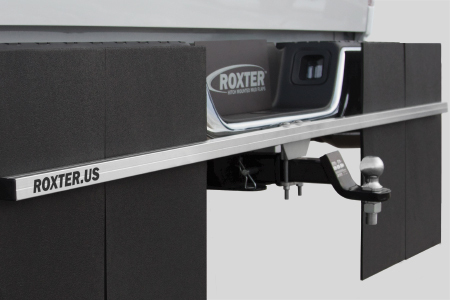 ROXTER™ Hitch Mounted Mud Flaps provide customizable protection with three-eighths inch rubber flaps on a simplistic frame. Design your own ROXTER™ Mud Flaps to be exactly how you want them. The sleek frame constructed of rustproof aluminum and zinc plated hardware allows visible access to receiver pin, wiring and safety chains. 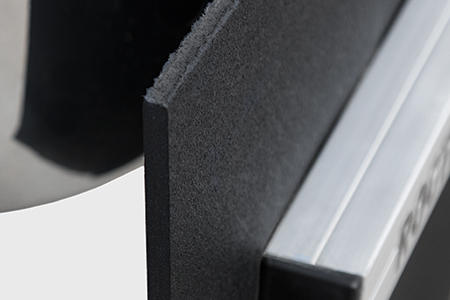 With an easy on/off design, ROXTER™ Mud Flaps secure to the ball mount with an adjustable clamping system. Remove by simply pulling the receiver pin. The lightly textured, yet smooth surface of the rubber minimizes accumulation of mud and ice. Rated to withstand extreme temperatures, the mud flaps remain flexible at -40° F and resist heat up to 200° F.
Improves style and rigidity. 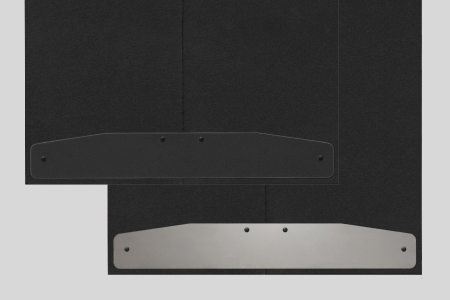 Choose clear coated aluminum or textured matte black by easily reversing the trim plate for your desired appearance. My Roxter mud flaps are a life saver. I pull a hunting trailer on dirt roads 6 months out of the year so rock protection is a big issue for me. My trailers havent had a rock dent since adding these to my truck. Easy to install and very lightweight. The ultimate mud flaps for anyone pulling trailers. I love my Roxter for its simple design and durability. It is rock solid and has hardly any movement when traveling down the road. It is a good feeling knowing that when I am towing, my load is protected from any flying debris. Overall, Roxter is the best mudflap I have ever had on my truck.